Though the holidays are over, I still love to indulge in a treat whether it be in the form of a favorite friend, food, or interviewee! I adore Samantha Yanks, editor in chief of both Gotham and Hamptons Magzines. I’ve interviewed her several times before and every time I learn something new about the city I call home. This time around Yanks shares a peak at her seasonal wish list, talks to us about New York’s hottest new restaurants, and lets us in on some new projects she has in the works. HS: How do you fight the winter blues? SY: It’s funny, with a child you rarely have time for the winter blues because you have to think of alternate ways to have fun in the city no matter how chilly it gets. Who knew that going to Doodle Doo’s for Sadie’s haircut could be so fabulous or bowling at Lucky Strike would turn into a heated family competition (Sadie is quite good), The Children’s Museum of the Arts (CMA) in Tribeca is a brilliant space for kids and the new IMAX film “Flight of the Butterflies” at the Natural History Museum is a must see. When you mix these activities up with some nice brunches at Rosemary’s who has time to have the blues? HS: What are a few of your favorite seasonal hotspots in New York? SY: One of my favorite new restaurants is Willow Road in Chelsea. I went for a private preview tasting before it opened and the Vermont burrata with crisp corn and basil is a sublime bite. The deep fried “unreal” candy bar is also pretty decadent and delicious. I love the coziness of Perla on a crisp winter evening. It’s by far my favorite new restaurant. I can’t say it enough, my go-to restaurants are always part of Keith McNally’s empire. I eat at either Pastis, Balthazar Minetta Tavern or Morandi a few times a week. 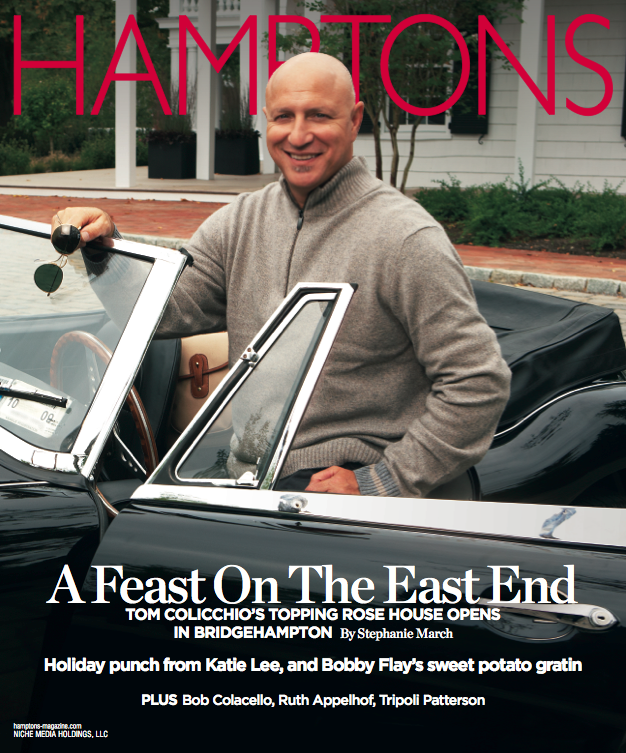 HS: How does the Hamptons transform during the off-season? SY: Oh, the Hamptons is simply beautiful in the winter time! It’s slower and quieter and we all say the same thing; there is considerably less traffic which is always welcome after the summer season. In the past few years more restaurants and shops stay open all year round. The long anticipated Topping Rose House from Tom Colicchio opened this Fall in Bridgehamtpon. He’s on our holiday issue of the magazine. The inn designed by Alexandra Champalimaud is gorgeous and Tom’s food is beyond divine. There is a private barn to throw parties at which will be the impossible to get reservation next season. HS: What’s on your wish list this month? SY: I adore Aerin’s new site Aerin.com for all things home decor. There is a lilac Tom Ford bag I am lusting after that is custom order so we’ll have to see. My friend Jennifer Fisher is a brilliant jewelry designer and she’s making me a #SPYLUXE bracelet. I put together pinterest boards of basically everything that is on my mind. Right now I am obsessing over a coral faced vintage gold Rolex watch. HS: It’s the season of coats – how do keep it chic, but layer up? SY: Oh, my coat closet! My husband would like to have further discussions about this. I love, love, love coats. Whenever I leave the house I ask “what is the proper topper?” The great thing about coats are that, particularly on the weekends, your outfit can be casual for running around but you can look pulled together with the right coat on top. I usually wear a black belted shearling on the weekend. During the week I tend to wear a ladylike cut. Right now I am equally in love with a Lisa Perry navy jacket and a Anya Hindmarch black coat with jazzy buttons. HS: Tell us about some of the projects you have in the works. SY: I’m designing my third collection of jewelry for Jennifer Miller which reflects my love of vintage pieces, my passion for interior design has led me to a few small projects with friends, Sadie (our five year old daughter) and I are working on a children’s book series and I have a lot of great television segments on the docket including a really smart project with my friend Amy Palmer for PowerwomenTV. The main focus is always the magazines though. Hamptons is embarking on it’s 35th season and Gotham has a stellar cover lineup. I’m extraordinarily proud to be the Editor in Chief of both. I have a weekly segment on Weekend Today on NBC New York called “The Scoop with Samantha”. We talk about some of the amazing experiences I have with celebrities and at parties. It’s an inside look. Of course I also give a first look at Gotham and Hamptons Magazines and interesting tid bits about our cover stars. HS: What was your favorite part about shooting this month’s Gotham cover with Uma Thurman? SY: I love so many aspects of this story. Uma discuss what it is like to have a child at a later stage in her life and how different that is from the children she had when she was younger. She’ a strong woman with a point of view and I respect that. Her choices are not for everyone but they are right for her. The commitment she has made to the Room to Grow organization is one I have a lot of respect for. Finally, how can you not love the fact that we asked her friend and designer Zac Posen to interview her? HS: What do you think of the recent news that Alexander Wang as the new designer for Balenciaga? SY: Balenciaga is a storied French fashion house and to have it in the hands of a young American designer is a huge coup. Wang’s aesthetic is similar to that of Balenciaga. He will take the brand to a new generation. Very little will hold him back and that is when great fashion is made. Thanks as always Samantha and we’ll meet again to give us a preview of Hamptons Magazine’s 35th season!